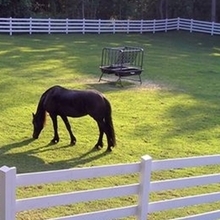 If you are interested in PVC High quality Safety horse arena fencing, zhejiang jovyea plastic profile co.,ltd If you are interested in 60related results, so you can compare and shop! Try finding the one that is right for you by choosing the price range, brand, or specifications that meet your needs. 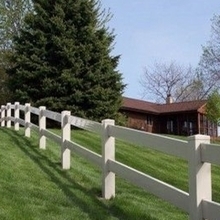 This is a 4 rail white pvc horse fence. Its size is 1.371mH*2.438mW,spacing between rails is 165mm. The height of the bottommost bar from the ground is 266mm. So it suitable for some small animals.